Games like Dark Souls, Bloodborne, Fez and Destiny get a lot of credit for challenging the packs of people who play them to put their heads together to solve puzzles: players share tips online and make message board breakthroughs. Nintendo kids were doing that on the playground a quarter century ago, of course, trying to figure out puzzles in the original Zelda. Now a new, unassuming Nintendo game has actually been programmed—perhaps a first for a Nintendo game—to empower its far-flung crowd of players to solve some of its puzzles together online. The game is Chibi Robo: Zip Lash, a 2D sidescroller that launched last Friday (my review is coming later this week). The game isn’t great, but the crowd-oriented puzzles in it are a tantalizing tease of an idea that might work marvelously in a Zelda, Metroid or, really, you name it. The designers have found a clever way to let players each contribute a tiny amount to unlocking some of the game’s mysteries (read: costumes for Chibi Robo—you know, fashion mysteries!). Most of Zip Lash involves standard single-player Nintendo side-scrolling. You control a character. You run. You jump. In this game you also grapple and swing. You collect stuff. That mostly doesn’t matter for the purposes of this article. Chibi Robo is a cute little robot, and in an entirely optional touch that does matter for the purposes of this article, players can dress him up in costumes. The costumes are initially locked off. You obtain each one by entering a level of Zip Lash that you’ve already cleared and chasing down a blue baby alien. 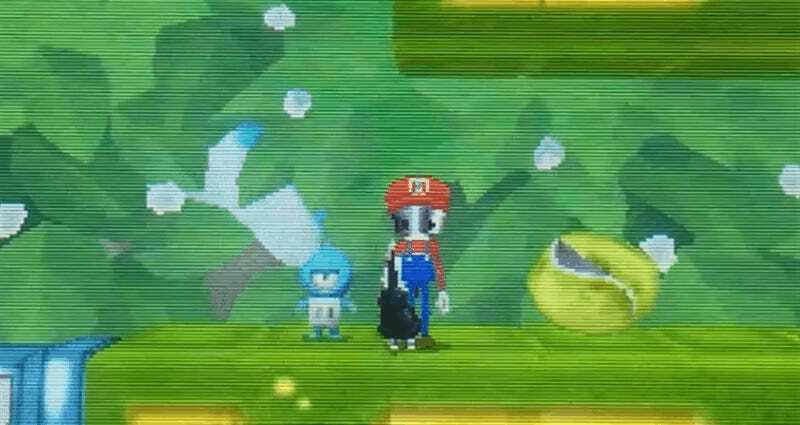 You grab the alien with your tail, carry or toss that baby alien toward a launch pad, then twirl it around Chibi Robo’s head so that it sings/cries loudly enough to attract another alien who will fly down in a saucer and rescue it. Yes, a perfectly logical sequence of events. The grateful aliens will reward you with a treasure chest. The chest usually contains coins, but sometimes it instead contains a new costume. If it contains a costume, the player will also be given one of five digits that comprise the unique five-digit code for that costume. The reason the game will, at best, randomly give you only one fifth of a code for a costume you just unlocked is because the game’s designers want you to help your fellow players out. Those players are also getting single digits of five-digit codes. The system everyone is playing Chibi Robo on, the Nintendo 3DS (or 2DS), connects online. More specifically, the system connects to Nintendo’s Miiverse community which has a standalone forum for, you guessed it, sharing Chibi Robo costume codes. Since Friday, the Miiverse’s “Outfit ID Exchange” has been slowly filled with screenshots from players who have unlocked costumes. Each screenshot contains a single digit. On Friday, launch day, most of the screenshots were from Zip Lash’s first six-level world, which contains five costumes that can be unlocked this way. Remember: no one player could have collected these numbers, because the game gives out costume code digits randomly and seems to stick most alien-rescuing players just with treasure chests full of coins. Together, though, the Zip Lash player community has been filling in the gaps. Any player can then take a full five-digit code and punch it into the game. Then, when they rescue an alien in the level that matches that code, they will be rewarded with the costume that goes with that code. That means that the labor here is divided. Some people are doing the finding. Many others are just doing the taking. Those who find the codes, one digit at a time, may be getting costumes partially out of luck, but those who aren’t even trying to get the codes can simply collect the costumes by using the five-digit codes that the rest of the player base collectively exposed. Once you input the five-digit code you keep the costume forever. This all may be terribly elaborate for a costume-unlocking system in Chibi Robo. It’s also clearly not complex enough for a game with a large player-base, given that the presumably small group of gamers who’ve been playing Zip Lash will at this rate have unlocked all the hidden codes in well under a week. Nintendo’s Miiverse might be a bad forum for this. The broader Internet will probably remain the ideal way for gamers to collaboratively solve the mysteries of the most confounding games. It’s true that Nintendo’s games can be programmed to hook right into Miiverse, and Nintendo’s systems can certainly snap screenshots and pool them in Nintendo’s social network for the sort of collaboration intended in Zip Lash. But it’s just not clear that Miiverse is designed well enough for this kind of thing. Even with Zip Lash, it doesn’t allow people to easily combine the costume digits that have been gathered, which is why some players (hello!) are collating them by hand in a notebook. It’s easy to imagine how Nintendo could scale this up—how it could maybe harness millions of Zelda gamers to slowly, carefully contribute to solving some hidden bonus puzzle in a new game in that franchise or how those players might all easily network together to figure out which bush to burn to find a dungeon’s hidden entrance. Zip Lash may simply be the company’s initial (alien) baby step.